The Town of Highland Park will hold the annual Tree Lighting Ceremony for the “Big Pecan Tree” on Armstrong Parkway, just west of Preston Road, on the first Thursday in December, at 6:00 p.m. The first lighting of the tree for the holiday season was by Flippin-Prather Realty in 1927 to promote their new development, Highland Park West. 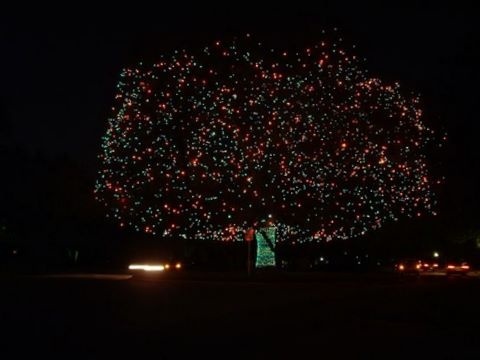 The tree has been adorned with lights every holiday season since then, except during World War II and during the 1973 energy crisis. The lighting of the tree is believed to be the oldest Christmas tradition in Dallas County. The tree requires four men and almost one week to decorate with over 5,000 red, blue, orange, and green Christmas lights.